The official beginning of the Deutsche Reichspost was in 1871, though this entity utilized the North German Confederation stamps until it produced its own stamps in 1872. Generally, the most popular German empire postage stamps produced by the Reichspost consisted of Germania stamps, which depicted a bust of Germania, clad in armor and bearing the imperial crown. The designs on these stamps were actually modeled from a portrait of actress Anna Fuehring, which was painted by Paul Waldraff, in which Fuehring dressed as Germania. The Germania stamps ran from 1900 to 1922 and featured the word “Reichspost” on each one, on paper that did not bear a watermark. Following the German Empire postage stamps of the classic era came the inflation issues, which followed World War I. These were issued during hyperinflation, at which time stamps were being issued that were valued at as much as 50 billion marks. These generally featured famous individuals of Germany on them. Post-inflation, the German Zeppelin stamps also emerged, which are notable for their high value to collectors. Toward the end of the “empire” era of stamps came the Third Reich issues, which ran from 1934 until 1945. 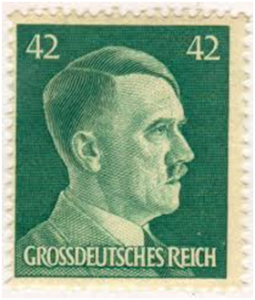 The common stamp of this era was one depicting Hitler’s portrait, and the inscription read “Deutsches Reich.” In 1945, just before the end of World War II, this was changed to “Grossdeutsches Reich” for a brief period of time. If you are interested in learning more about the fascinating German empire stamps, we invite you to contact Treasure Coast Stamps directly.